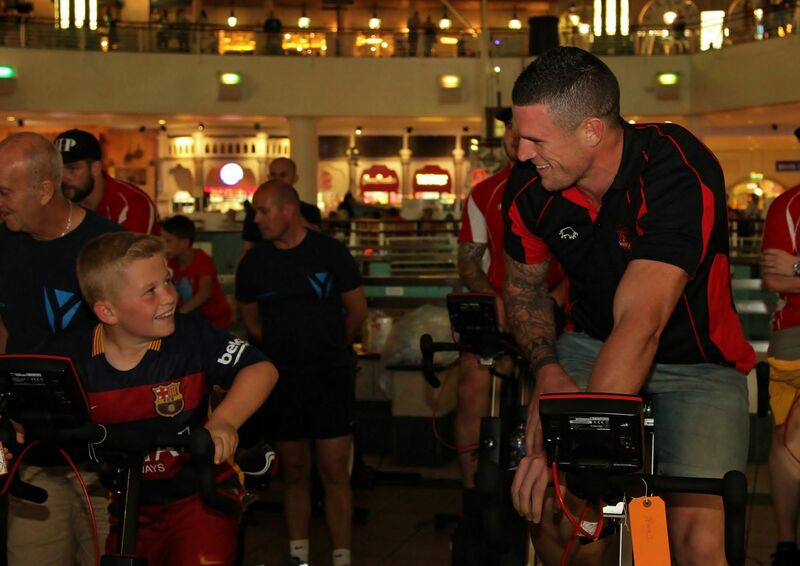 The Salford Red Devils hosted a unique fundraising event on Friday and Saturday, at the intu-Trafford Centre as they held the ‘Virutal Ride to Rio’ charity cycle challenge. The event took place in support of former red Paul Highton, who is currently on an epic adventure, cycling from London to Rio de Janeiro in Brazil to raise money for the Jane Tomlinson Appeal, Rugby League Cares, The Joshua Wilson Brain Tumour Charity and the Salford Red Devils Foundation. Red Devils fans, players and staff came out in force to support the event, which took place in the centre of the Trafford Centre food court, participating in a variety of different cycle challenges, in an attempt to emulate just a fraction of the challenge being taken on by Highton and the Ride to Rio team. Amongst the Salford Red Devils players in attendance was new signing Luke Burgess, who was quick to jump on a bike and do his bit for the cause, as well as meeting the fans for the first time. Burgess was joined by Rugby League Cares patron and Huddersfield Giants player Ryan Brierley, and both were in high demand for photos and autographs, alongside the Super League Trophy. To complete the star studded line-up, actor Jody Latham, famous from shows such as Shameless, lent his support on Friday, interacting with the crowd, and persuading shoppers to have a go on the bikes. Alongside the races being undertaken by the public, there was also a number of corporate challenges, as teams from the Super Josh Charity, Rugby League Cares and the Lighthouse Church competed against a Salford legends team, and the Red Devils under 19’s as well as a team from the Red Devils Foundation. 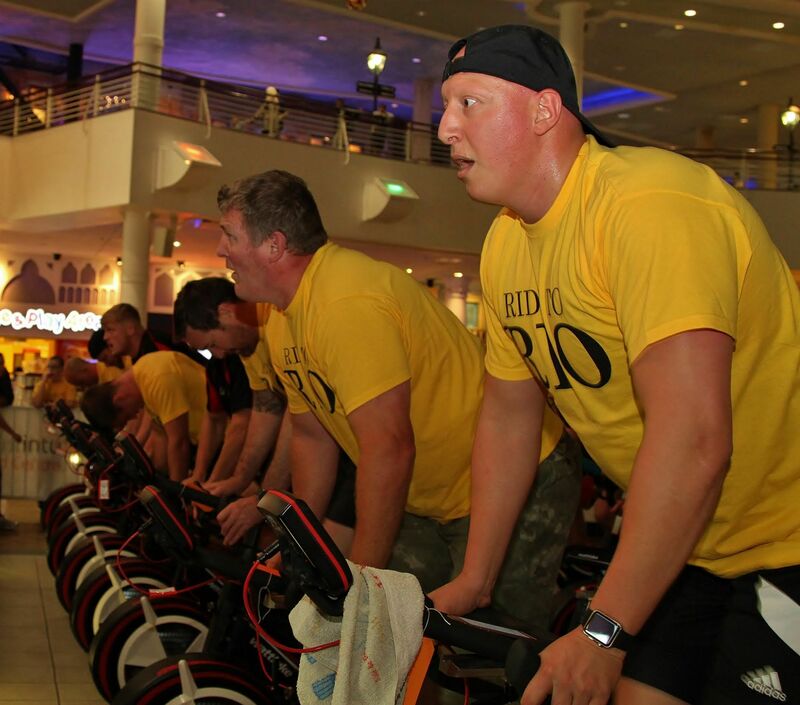 “Thank you to everybody who got involved in the Ride to Rio challenge at the Trafford Centre. We massively appreciate it, it’s helped us a lot knowing that you guys are going through a bit toil and trouble like we are!”. Anyone who wishes to donate to Paul’s cause can do so by texting JRTR70 £5 to 70070.